As you may have already read, I wrote three Singapore travel posts here, here and here. However, we did a 1-day detour to Legoland on day 2 of 4 day trip. Malaysia is just a bridge away from Singapore so if you’re visiting either of the two countries, might as well go to the other. You will then be able to cover two countries with just a bus ride and not the typical expensive plane route. As much as we want to tour around Malaysia, our main goal really was just Singapore. 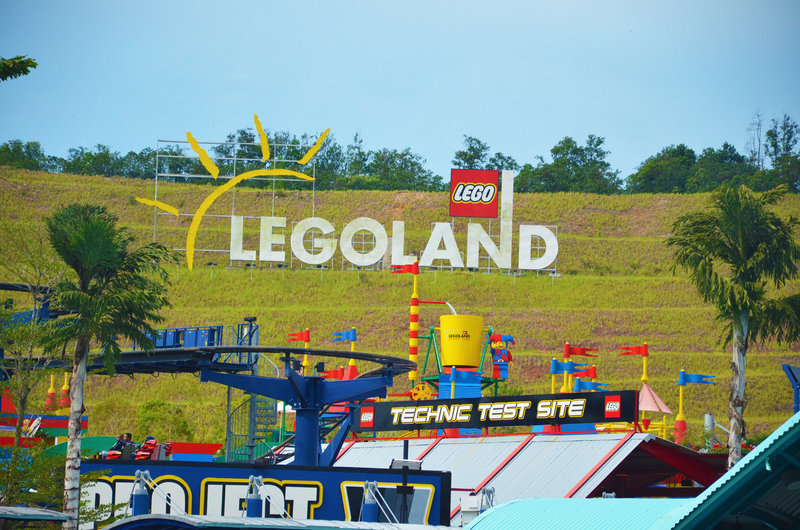 Legoland is fairly new in Malaysia so we thought we could give it a try. It is located in Johor Bahru, just an hour away from mainland Singapore. Legoland Malaysia is divided into the Theme Park and the Water Park. We only went to the Theme Park but you can visibly watch people play in the water park from the theme park rides. Upon entering the theme park, you will be greeted by various shops and restaurant and further on is the Miniland which is a grand display of Lego models of Asia’s famous landmarks. I’m thinking this is the Tower Bridge of London but knowing that it was an Asia-only display, I can’t really remember what this is. Rather fascinating that they chose this little town to represent the Philippines. I honestly would say there are far more beautiful cities in our country but seeing the rest of the mini-Philippines, it actually depicts a proper Filipino town with the Barangay Hall and various banka (boats) and jeepneys. I love that it’s pink since I’ve actually seen Barangay Halls (town halls) here that are colored pink. A typical Filipino town or “palengke” or “merkado”. You would actually see men in these kind of eateries drinking beer just a few steps away from the streets. This fishing boat was moving around the mini-Philippines. There are a few rides in the Theme Park and there are ones which are still in progress. I love how it wasn’t stressful at all to line up for the rides. Usually, big theme parks like the Alton Towers or the Universal Studios, lines would be an hour long, however, in Legoland, we got on all of the rides thrice. We were so bored at the end of the day that we just went on repeatedly everywhere. It came to the point that me and my brother was just playing “where is the camera” during the ride. We ended up posing perfectly for the camera in the kiddie roller coaster and just had to buy it. One of the early rides that we did, The Dragon’s Apprentice (rightly named as there is also The Dragon, a bigger version of this one). We started with the small one to build momentum and to “test the waters”. Project X, which has the highest drop out of all the rides. We loved it and although scary, we still did it thrice as what we did with the other rides as well. The Beetle Bounce. It is a big hit to really young children, as you can see in the photo above, so it’s rather humiliating to scream more than they do. All they do is laugh! Thankfully, all I did was laugh as well. How awkward would that be to cry while the little girl beside me laughs all the way through? A failed moment for me. I was supposed to film this but didn’t know that the GoPro was on “photo” mode, so all it ever took was this shot. You don’t get to bring cameras on rides very often, so when the opportunity presented itself, I excitedly “filmed” ourselves during the Beetle Bounce. The Miniland and Legoland Hotel behind us. We didn’t explore all of the rides and attractions in Legoland as some of it were too child-friendly. I do understand that most of Legoland is targeted for the young ones and it’s actually a nice place for them to enjoy unlike other theme parks where it would be too adrenaline fueled. It is also very hot and humid in Malaysia and there wasn’t a lot of shade so be sure to bring umbrellas. We ended up buying one Legoland umbrella, you can find them at the shops when you enter the park. But of course, the Legoland experience won’t be complete without playing with Legos! After a very hot day, find the gigantic Lego Einstein and go inside to build your Legos or attend Lego classes. It is a nice place to have a break because it was air conditioned and there’s actually two massage chairs that my parents get to enjoy for 10 minutes for 10 Malaysian Ringgit. And our youngest with his sword which was too short it looks like a gun. Ha! It was a nice visit and the theme park may need a day but I think it would be well worth it if you include the water park in your trip.